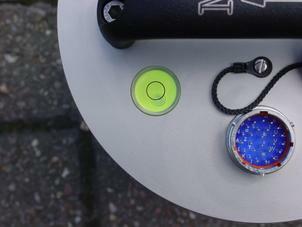 The top panel of the sensor includes a spirit level. To adjust the height of a foot, loosen the brass locking nut and screw the foot either in or out. 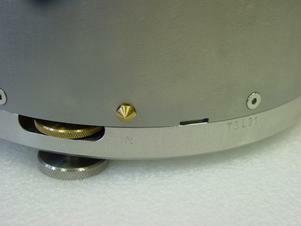 When you are happy with the height, tighten the brass locking nut to secure the foot. Gently check the foot to ensure that it is locked. Connect a 12 V power supply to its POWER socket through the breakout box. Check the mass position outputs using a digital multimeter, digitiser or the handheld control units. If required, re-centre the masses by pressing the ENABLE and CENTRE buttons on the breakout box together. 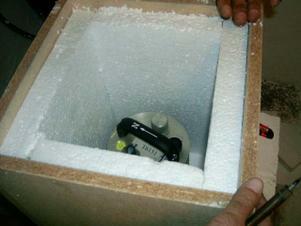 Cover the instrument with thermal insulation, for example, a 5 cm expanded polystyrene box. This will shield it from thermal fluctuations and convection currents in the vault. 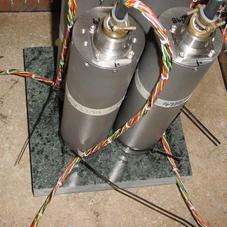 It also helps to stratify the air in the seismometer package. Position the thermal insulation carefully so that it does not touch the sensor package. This is the simplest method of providing an instrument with a suitable environment for high-quality seismic signals. Depending on the time and resources available, this type of installation can suit all kinds of deployment, from rapid temporary installations to medium-term telemetered stations. 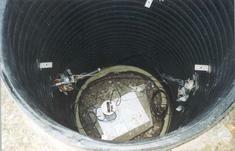 Ideally, the sensor should rest directly on the bedrock for maximum coupling to surface movements. However, if bedrock cannot be reached, good results can be obtained by placing the sensor on a granite pier on a bed of dry sand. On granite or other hard bedrock, use an angle grinder to plane off the bedrock at the pit bottom so that it is flat and level. Stand the instrument directly on the bedrock, and go to step 6. On soft bedrock or subsoil, you should install a pier as depicted below. Pour a layer of loose, fine sand into the pit to cover the base. The type of sand used for children’s sand-pits is ideal, since the grains are clean, dry and within a small size range. On top of the sand, place a smooth, flat granite plinth around 20 cm across, and shift it to compact the sand and provide a near-level surface. Placing a granite plinth on a sand layer increases the contact between the ground and the plinth, and improves the performance of the instrument. There is also no need to mix concrete or to wait for it to set, as in step 4. Alternatively, if time allows and granite is not available, prepare a concrete mix with sand and fine grit, and pour it into the hole. Agitate (“puddle”) it whilst still liquid, to allow it to flow out and form a level surface, then leave to set. 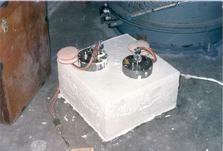 Follow on from step 6.Puddled concrete produces a fine-textured, level floor for emplacing the seismometer. However, once set hard, the concrete does not have the best possible coupling to the subsoil or bedrock, which has some leeway to shift or settle beneath it. Alternatively, for the most rapid installation, place loose soil over the bottom of the pit, and compact it with a flat stone. Place the seismometer on top of this stone. This method emulates that in step 3, but can be performed on-site with no additional equipment. Set up the instrument as described above, in steps 4 to 9. The instrument must now be shielded from air currents and temperature fluctuations. This is best done by covering it with a thermal shield.An open-sided box of 5 cm expanded polystyrene slabs is recommended. If using a seismic plinth on sand (from steps 3 or 5), ensure that the box is firmly placed in the sand, without touching the plinth at any point. In other installations, tape the box down to the surface to exclude draughts. Alternatively, if a box is not available, cover the instrument with fine sand up to the top.The sand insulates the instrument and protects it from thermal fluctuations, as well as minimizing unwanted vibration. Cover the pit with a wooden lid, and back-fill with fresh turf. The recommended installation methods have been extensively tested in a wide range of situations. 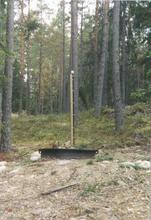 However, past practice in seismometer installation has varied widely. However, noise tests show that this method of installation is significantly inferior to the same concrete plinth with the tiles removed (right). 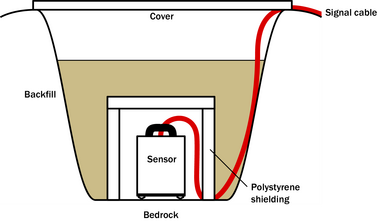 Horizontal sensors show shifting due to moisture trapped between the concrete and tiling, whilst the vertical sensors show pings as the tile settles. Again, this method produces inferior bonding to the instrument, and moisture becomes trapped between the hard surfaces. We recommend the use of fine dry sand (right) contained in a box if necessary, which can also insulate the instrument against convection currents and temperature changes. Sand has the further advantage of being very easy to install, requiring no preparation. Finally, many pit installations have a large space around the seismometer, covered with a wooden roof. Large air-filled cavities are susceptible to currents which produce lower-frequency vibrations, and sharp edges and corners can give rise to turbulence. 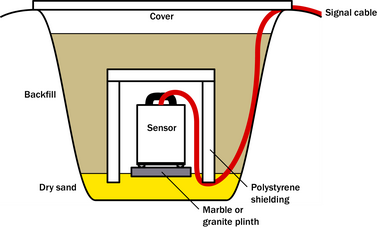 We recommend that a wooden box is placed around the sensor to protect it from these currents. Once in the box, the emplacement may be backfilled with fresh turf to insulate it from vibrations at the surface, or simply roofed as before. By following these guidelines, you will ensure that your seismic installation is ready to produce the highest quality data.